By the end of nineteenth century, food was dangerous. Lethal, even. "Milk" might contain formaldehyde, most often used to embalm corpses. Decaying meat was preserved with both salicylic acid, a pharmaceutical chemical, and borax, a compound first identified as a cleaning product. This was not by accident; food manufacturers had rushed to embrace the rise of industrial chemistry, and were knowingly selling harmful products. Unchecked by government regulation, basic safety, or even labelling requirements, they put profit before the health of their customers. By some estimates, in New York City alone, thousands of children were killed by "embalmed milk" every year. Citizens--activists, journalists, scientists, and women's groups--began agitating for change. But even as protective measures were enacted in Europe, American corporations blocked even modest regulations. 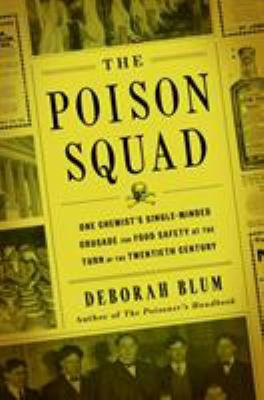 Then, in 1883, Dr. Harvey Washington Wiley, a chemistry professor from Purdue University, was named chief chemist of the agriculture department, and the agency began methodically investigating food and drink fraud, even conducting shocking human tests on groups of young men who came to be known as, "The Poison Squad." Over the next thirty years, a titanic struggle took place, with the courageous and fascinating Dr. Wiley campaigning indefatigably for food safety and consumer protection. Together with a gallant cast, including the muckraking reporter Upton Sinclair, whose fiction revealed the horrific truth about the Chicago stockyards; Fannie Farmer, then the most famous cookbook author in the country; and Henry J. Heinz, one of the few food producers who actively advocated for pure food, Dr. Wiley changed history. When the landmark 1906 Food and Drug Act was finally passed, it was known across the land, as "Dr. Wiley's Law." Blum brings to life this timeless and hugely satisfying "David and Goliath" tale with righteous verve and style, driving home the moral imperative of confronting corporate greed and government corruption with a bracing clarity, which speaks resoundingly to the enormous social and political challenges we face today.